Just following Jesus in my real life...: Take refuge! Rejoice! Sing for joy! 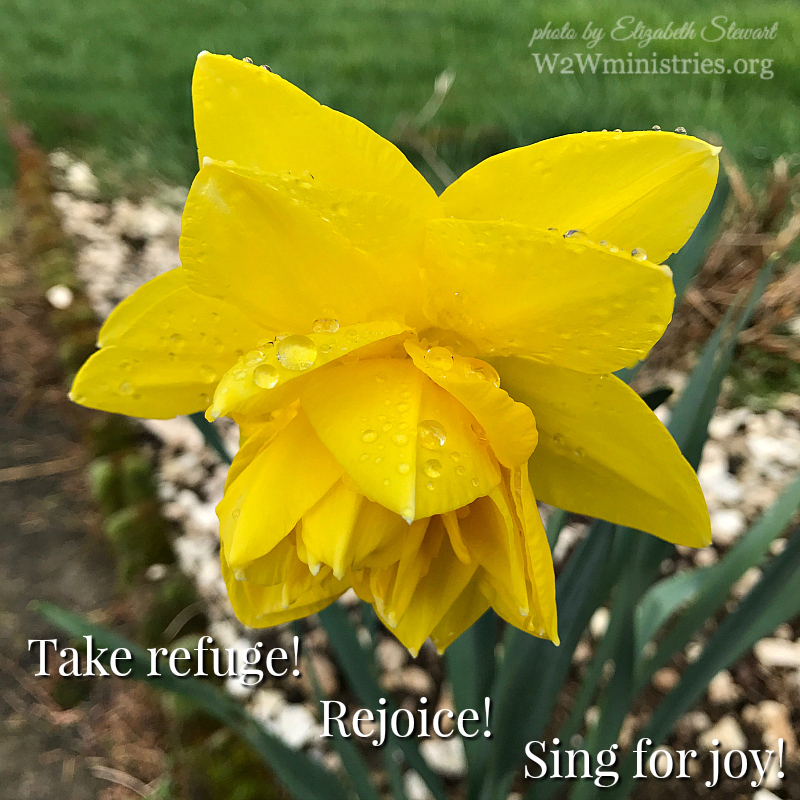 Take refuge! Rejoice! Sing for joy! Yesterday we had an unusual spring wind and rain storm. Here in the northwest Oregon/southwest Washington region spring rain is a given. However, high winds, (and even some small tornadoes on the coast), are not common for us this time of the year. Like yesterday's weather, life's storms usually hit us unexpectedly. We are sailing along through our day when, suddenly, a letter in the mail, or a doctor's report, or a phone call hits us with some bad news. Instantly, our emotions go on high alert. "Panic!" they tell us. "Do something!" "Run!" Our mind listens to our emotions and begins to plot how to fix the situation or our thoughts may run along with our emotions and begin imagining a worst case scenario. At times like this it's good to stop, take a deep breath, and choose to take shelter in the refuge of God's loving protection. The truth is, what may be an unpleasant surprise to us did not catch God unawares. what a perfectly lovely post for me to read before shutting down my computer and going to bed. leaning in to His embrace. always. though there's a storm, i can yet rejoice for He is my Rock. Love to you, friend. May God comfort you in your heartache and give you His unfathomable peace. I love this! It's so true that "The truth is, what may be an unpleasant surprise to us did not catch God unawares." God is never surprised, which should be a comfort to us. Thanks for sharing on the #sundaythoughts link up! And happy Palm Sunday. I do take comfort in this, that God is ultimately and always in control! Have a richly blessed Holy Week! I need to keep coming back to the truth that nothing takes God by surprise. That's such a helpful mindset. It helps me to remember this as well!